SiliconX: New material discovery for lithium-ion batteries? Thanks to New Atlas, we find encouraging news concerning the continuing evolution of lithium-ion battery technology and other energy storage options. For years, scientists have seen silicon as a hugely promising material in the world of lithium-ion batteries. The primary reason for this is that using it as the anode could mean batteries with 10 times the capacity of current versions – at least in theory. But in reality, it easily breaks apart as the battery goes through its charging cycles. Scientists at Norway’s Institute for Energy Technology are now claiming to have overcome this problem with a new material they call SiliconX. The researchers describe the new material as the “x factor” they’ve been looking for, and that is no small claim. For years, scientists around the world have been trying to work out how to stabilize relatively fragile silicon as a battery anode, the electrode through which the electrical current flows into the battery. And we’ve seen many experimental technologies show big promise in the lab. Some of the more interesting approaches include putting silicon inside a graphene cage, crushing it into a powder, using it as nanowires measuring a few microns in length, and deploying it in nanoparticle form. The team has carried out testing in the lab and says, although the new battery design compromises initially on capacity, its stability throughout charging cycles means that it winds up with far better capacity than a fast-degrading pure silicon anode, and three to five times the charge capacity of the graphite anodes used in today’s batteries. If these kinds of results can be reproduced beyond the lab, it could one day make for mobile phones that only need to be charged twice a week, or electric vehicles that can be driven more than a thousand miles on a single charge. That is still quite a big “if”, but the scientists have support from the Research Council of Norway to continue the work and are teaming up with private partners to try and bring SiliconX to market. I look forward to learning and seeing more of this promising material. We need all the best discoveries in battery technology and electrical energy storage. Comments Off on SiliconX: New material discovery for lithium-ion batteries? The world’s first ‘Biological House’ has opened its doors to visitors and sets a new high standard for eco-friendly buildings. The leading forces behind this innovative build, Een til Een(link is external), built the house in secrecy, and eventually welcomed visitors from all over the world. Located in Middelfart, Denmark, and made from upcycled materials including Kebony Character cladding, the Biological House is a modern, sustainable and modular housing concept with a specific focus on architecture, materials, indoor air quality and unique design. A ‘biological house’ is typically built with upcycled agricultural industry residual products, materials including grass, straw and seaweed, which would normally be considered waste and burned for energy. These materials will instead be processed into valuable natural building materials, forming the bulk of the raw materials needed for the project and thereby avoiding the environmental impact that burning them would cause. Design and construction of this novel project has been a rigorous process, with innovative techniques being tested and developed along the way. Instead of a traditional concrete foundation, which is carbon intensive and doesn’t allow the same recyclability, the building sits upon screw piles, typically used for building deep foundations with minimal noise and vibration. The development is fully supported by the Danish Ministry of the Environment Fund for Ecological Construction, with all materials used in the build thoroughly tested and approved and available commercially. Sustainability was of paramount importance to the architects during all stages of design and construction, so they selected Kebony for the cladding due to its environmental credentials, as well as the beautiful silver-grey patina it forms over time. Developed in Norway, the patented Kebony technology is an environmentally friendly process, which modifies sustainably sourced softwoods by heating the wood with a bio-based liquid. By polymerising the wood’s cell wall, softwoods permanently take on the attributes of tropical hardwood including high durability, hardness and dimensional stability. From conception to completion, more than 40 major partners have been involved in the construction of the Biological House including Novofibre(link is external), Horn Group(link is external), Thermocell(link is external), Derbigum(link is external), Rheinzink (link is external)and Kebony. The Biological House is the first construction to open as part of the BIOTOPE – a unique new exhibition park and knowledge centre for sustainable construction and Denmark’s largest permanent construction exhibition. I hope to see more such projects as this. The future for such work appears very bright. The possibility of sustaining world energy needs away from the empire of fossil fuels by tapping into cleaner renewable energies like solar and wind has always looked immensely promising, save for a few roadblocks like cost, storage availability, and the absolute lack of available full-time sunshine or wind. Sustainability enthusiasts tracking new discoveries for the creation of renewable fuels should be encouraged by this research breakthrough from University of Central Florida chemistry professor, Fernando Uribe-Romo. “The process has great potential for creating a technology that could significantly reduce greenhouse gases linked to climate change, while also creating a clean way to produce energy. “Uribe-Romo and his team of students created a way to trigger a chemical reaction in a synthetic material called metal–organic frameworks (MOF) that breaks down carbon dioxide into harmless organic materials. Think of it as an artificial photosynthesis process similar to the way plants convert carbon dioxide (CO2) and sunlight into food. But instead of producing food, Uribe-Romo’s method produces solar fuel. The following video link features Uribe-Romo explaining the process: click here. “It’s something scientists around the world have been pursuing for years, but the challenge is finding a way for visible light to trigger the chemical transformation. Ultraviolet rays have enough energy to allow the reaction in common materials such as titanium dioxide, but UVs make up only about 4 percent of the light Earth receives from the sun. The visible range – the violet to red wavelengths – represent the majority of the sun’s rays, but there are few materials that pick up these light colors to create the chemical reaction that transforms CO2 into fuel. “Researchers have tried it with a variety of materials, but the ones that can absorb visible light tend to be rare and expensive materials such as platinum, rhenium and iridium that make the process cost-prohibitive. “Uribe-Romo used titanium, a common nontoxic metal, and added organic molecules that act as light-harvesting antennae to see if that configuration would work. The light harvesting antenna molecules, called N-alkyl-2-aminoterephthalates, can be designed to absorb specific colors of light when incorporated in the MOF. In this case he synchronized it for the color blue. “His team assembled a blue LED photoreactor to test out the hypothesis. Measured amounts of carbon dioxide were slowly fed into the photoreactor — a glowing blue cylinder that looks like a tanning bed — to see if the reaction would occur. The glowing blue light came from strips of LED lights inside the chamber of the cylinder and mimic the sun’s blue wavelength. “It worked and the chemical reaction transformed the CO2 into two reduced forms of carbon, formate and formamides (two kinds of solar fuel) and in the process cleaning the air. “He wants to see if the other wavelengths of visible light may also trigger the reaction with adjustments to the synthetic material. If it works, the process could be a significant way to help reduce greenhouse gases. “Perhaps someday homeowners could purchase rooftop shingles made of the material, which would clean the air in their neighborhood while producing energy that could be used to power their homes. While this simply put proposition sounds remarkably logical, if this technology proves to be successful, such a change to this planet’s energy infrastructure will represent a monumental challenge. Of note, other members of the Uribe-Romo team included UCF graduate student Matt Logan, who is pursuing a PhD in chemistry, and undergraduate student Jeremy Adamson, who is majoring in biomedical sciences. Kenneth Hanson and his research group at Florida State University helped interpret the results of the experiments. The findings of his research have been published in the Journal of Materials Chemistry A . 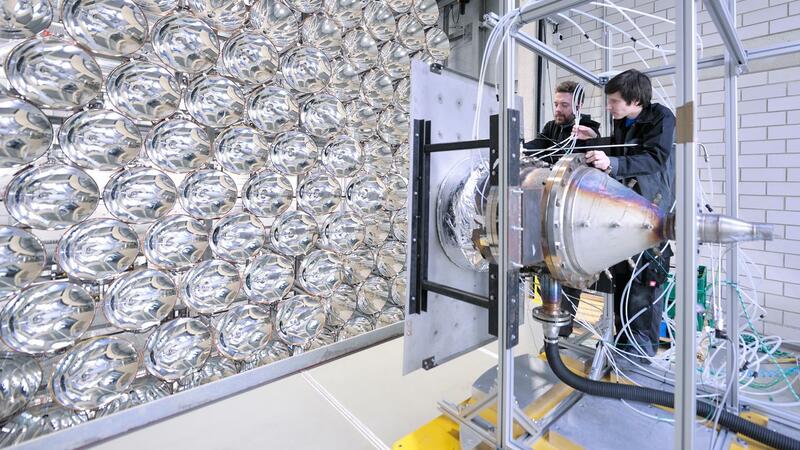 For those who continue to ask (myself included) about the future of cleanly producing hydrogen, we put a spotlight on this March 23 press release about the development of this artificial sun in Germany. 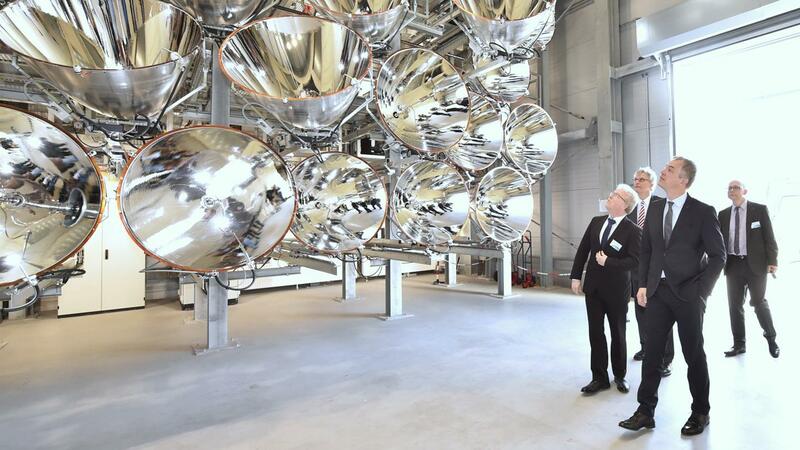 The largest artificial sun in the world is located at the DLR site in Jülich. 149 High-power emitters can generate a multiplicity of solar radiation. The development of solar fuel production is progressing faster due to weather independence. The largest artificial sun in the world has appeared in Jülich since 23 March 2017. 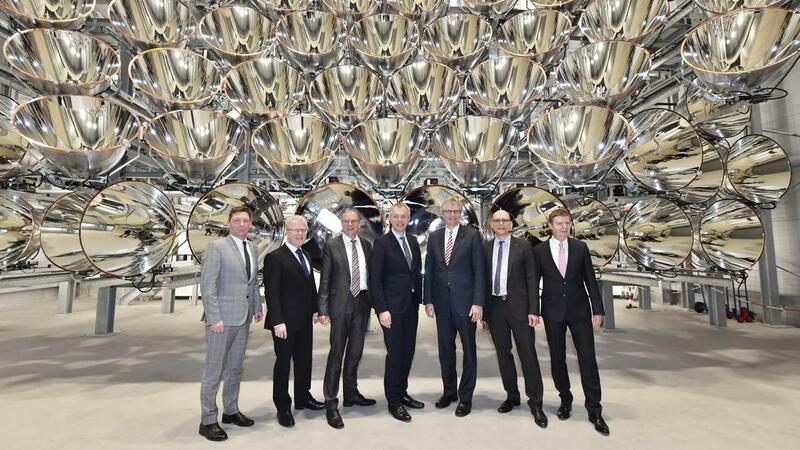 Johannes Remmel, the North Rhine-Westphalian Minister of the Environment, put the new research facility ” Synlight ” into operation, together with Dr. Georg Menzen (BMWi) and Prof. Dr. Karsten Lemmer, Member of the Board for Energy and Transport of the German Aerospace Center (DLR) . The plant will be used, among other things, to develop production processes for solar fuels such as hydrogen. In the three-storey Synlight building, a total of 149 xenon short arc lamps emit. For comparison: in a large cinema the screen is irradiated by a single xenon short arc lamp. The scientists can focus the radiators on an area of ​​20 by 20 centimeters. If the radiation of the lamps with an output of up to 350 kilowatts occurs there, it has the up to 10,000 times the intensity of the solar radiation on the earth. The lamps focus on temperatures up to 3,000 degrees Celsius. These temperatures are used by researchers to produce fuels such as hydrogen. Since the sun is rare and irregular in Central Europe, an artificial sun is the medium of choice for the development of production processes for solar fuels. With the Synlight tests, bad weather periods and fluctuating radiation values ​​can not make the tests or their evaluation more difficult or slow down. 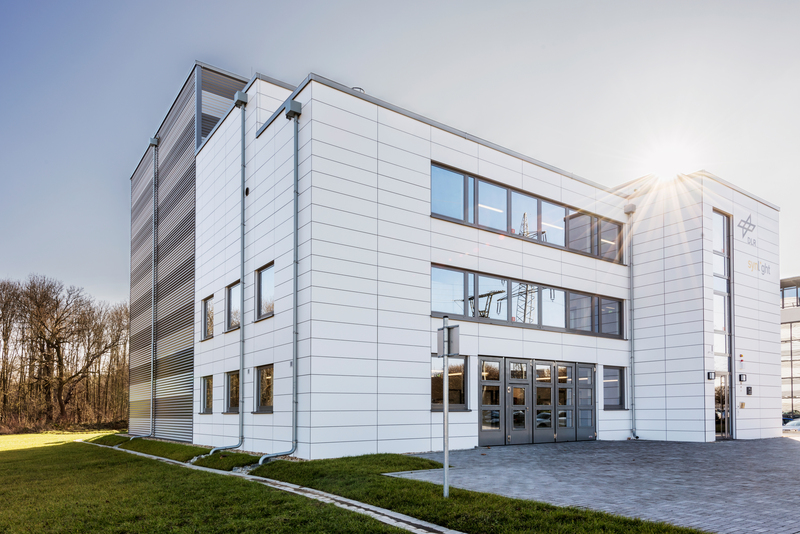 With its infrastructure, including the Solarturm Jülich and the scientific environment, Jülich also offers ideal conditions for innovative developments in solar technology. A shift from research facilities to more sun-drenched regions promises, at first glance, more favorable conditions, since even there the sun never shines with the same intensity. But that is important for fast innovation cycles: constant test conditions, which can be reproduced quickly and exactly. The scientists at the DLR Institute for Solar Research have already succeeded in producing hydrogen with the aid of solar radiation years ago , but at a laboratory scale. In order for such processes to become of interest to industry, the scale must be significantly increased. This is precisely the goal of Synlight. Research is focused on solar fuel production, but the new plant can be used for many other applications. Since the spectrum of the UV radiation is similar to that of the sun, aging processes of materials can also be shown in a timed manner. An interesting aspect, both for space and industry. For the experiments, three irradiation chambers are available to users of the facility. Depending on the requirements, the necessary lamps are bundled or surface-aligned to the test setup. With the three chambers, several experiments can be prepared at the same time and the system can be optimally utilized. 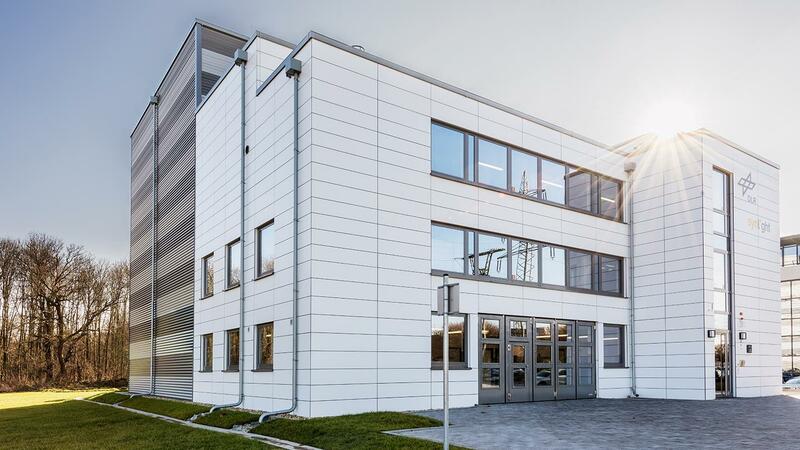 The DLR Institute for Solar Research has built the research facility in a building constructed by the Jülich Technology Center over the last two years and rented it to Synlight for the long term. The state of North-Rhine Westphalia supported the project with 2.4 million euros, about 70 percent of the total sum of 3.5 million euros. The difference of 1.1 million euros was provided by the Federal Ministry of Economics and Energy (BMWi). For more information about this project, use this contact list. Solar shingles are now gaining increasing traction in the renewable energy landscape. They are architecturally distinctive, more so than traditional rooftop photovoltaic panels. Solar shingles provide an integrated building product providing both roofing security and solar electricity in one package. Two of this industry’s solar shingle pioneers are Robert and Gary Allen, brothers and partners in Rochester, Michigan-based Luma Resources. The two men answered my questions about their innovative building-integrated photovoltaic (BIPV) products and provided these helpful photographs. Structurally, a polycrystalline photovoltaic tempered glass module is adhered to a custom formed metal shingle. A premium plastic edge protector surrounds the glass to provide added durability. The junction box located on the back is positioned in the center of the shingle, allowing equal length wires to run in either direction. Meyers: In short, what factors led to the development of your solar shingles? Robert Allen: It all started with a phone call. I knew a man who worked for a German company, Rheinzink. He knew that our roofing company (Allen Brothers) excelled in specialty roofing and sheet metal. He’d gotten a call from then solar-leader, United Solar Ovonics (USO). Rheinzink was doing a lot of business with USO in Germany. USO asked him if he had any ideas on how USO might gain entrance into the residential solar market. He told them he didn’t have a clue, but based on their area code — being the same as mine — they should call us. They called just before Christmas in 2006. Meyers: Where was your first product launched, and can you describe the performance successes and drawbacks? Robert Allen: We showed our product for the first time at the International Roofing Expo in Las Vegas. We had a 10 x 10 foot booth along with a smaller display in the new products pavilion. Thousands of contractors from all over the world walk the Expo. There they see about 50+ new products being introduced into the roofing and construction market for the coming year. During the Expo, attendees are asked to vote for the best new product of the year. Our Luma Solar Roof took first place. When asked why they voted for Luma: they saw it as something they could add to their product offerings back home and make money with. Meyers: How about system performance? Gary Allen: The performance success has been very nearly flawless. Our biggest challenge has been helping educate interested parties about rooftop solar versus traditional rack-and-frame. For example, we actually enhance the roof’s strength as opposed to traditional rack-and-frame solar that weakens it. The general public does not yet fully understand, but that is changing with all the press and growing demand about roof-integrated solar. Meyers: Who were the product developers, and did this effort generate interest from other companies? Robert Allen: Gary was the key developer of the Luma Solar Roofing system. His 30 years of experience in the roofing and sheet metal industry doing some of the most challenging projects in our market area paid off big. When we were asked by USO if we could figure out a way to make their thin-film solar laminate work on a residential roof he saw the solution in his mind right away. Three days later he had the prototype shingle finished. As to the question of our product generating interest from other companies, the answer is yes. Within a year, Dow came out with the Power House Solar Shingle, and a small company called BIPV Solar came out with its product. Dow has closed down its solar shingle division with its most recent merger with DuPont. BIPV was private labeled by Saint-Gobain (French conglomerate) through its CertainTeed division, they now call it the Apollo Tile. Saint-Gobain approached Luma ahead of BIPV Solar but we weren’t looking for a partner and turned them down. Meyers: Describe some of your solar shingles demos, locations, and comparative costs. Robert Allen: Although we have been involved in demos in the past, in a certain way every Luma job is a roofing demo, in a sense. Our product is first a fully weatherproof roofing system complete with its own R listing (R for roofing) at Underwriters Laboratories. When we add the solar component to the top of the metal roofing shingle it also becomes a solar roofing system. Luma Solar Roofs are located throughout the United States, Canada, and the West Indies. Gary Allen: We currently have two active Luma demos for purposes of R&D. One is located in Detroit on the campus of NextEnergy. They are a 501(c)(3) nonprofit organization established in 2002 to drive advanced energy and transportation investment and job creation. The second demo is on the campus of Western Michigan University in their “Solar Garden.” They will be using it as part of their clean energy degree program. Robert Allen: Luma’s “comparative cost” can only be looked as it relates to the cost of the roof and the cost of the solar. Luma is the original, and to date, only complete solar roofing system. We cover the entire structure’s roof with either the Luma Metal Shingle or Solar Metal Shingle. Others use a patchwork method. Roofs are sold on a certain price per square foot. Solar is sold on a certain price per watt. Luma’s “comparative cost” would be equivalent to a high-end custom roof that is fully weatherproof and powers your house, as well as beautifying it. Meyers: While the roofing system is architecturally attractive, how do longevity and performance fit? Gary Allen: The 24-gauge painted galvanized metal that Luma uses to form its shingle has a 30-year warranty on the paint finish. The metal shingle itself is a lifetime product. The solar laminate has a 25-year power generation warranty. Interestingly, some of our systems still function after surviving multiple hurricanes, hail storms and other acts of nature. Meyers: Who are some of the champions for your company and your solar shingles product? Robert Allen: Here are some: PV Technical Services, Ontario, Canada 50 + – Luma Solar Roofs; Yale Acres Subdivision, Meriden, Connecticut; Home Land Builders, Ann Arbor, MI; Teddington Farms Eco Tourism Retreat, Portland Perish, Port Antonio Jamaica. Two off-grid Eco Tourism Lodges completed, five more to go. Mr. John Sarver, former head of the Michigan Department of Energy and first Luma customer post-UL listing. John is the current head of Great Lakes Renewable Energy Association (GLREA). He’s a strong solar advocate and sought after public speaker. John loves to tell the story that he wanted to put solar on his roof for decades (before Luma) but his wife wouldn’t let him. She hated the way traditional solar would make her beautiful house look. That is, until he showed her the Luma Solar Roof. Thanks to Robert and Gary Allen for the time they have provided. I look forward to learning more about solar shingles and projects from Luma Resources. When it opens this summer, US Bank Stadium in Minneapolis will feature the only ETFE (ethylene-tetra-fluoro-ethylene) roof on a sports facility in the United States. This resilient and transparent material, long used in Europe, will now provide Minnesota Vikings football fans with a comfortable experience inside the stadium and a clear view outside, even if the outdoor temperature is far below zero degrees Fahrenheit. In contrast to the preponderance of opaque domed stadiums in this country, some 60% of the Vikings’ facility has been covered with ETFE, not only letting in daylight, but allowing fans to gaze skyward and enjoy the view. Add to this, this dramatic stadium features five of the world’s largest operable glass doors, which can be opened if the weather outside is pleasant. These gargantuan doors measure 55 feet in width, angling from 75 feet to 95 feet in height, and weighing approximately 57,000 pounds each. Of note, the large door system also contains five smaller doors which can be used when the large doors re closed due to inclement weather. As the stadium nears completion, a diverse group of journalists — specializing in everything from architecture to sports — had the opportunity to visit this 1.75 million sq. ft. structure, including 248,000 sq. ft. of ETFE roof, and listen to very articulate presentations from many on the design and development team, including leadership from the Minnesota Vikings. I found no shortage of good stories to report, most which will follow later this month. Here I report on the old stadium, the new stadium, and this remarkable material, ETFE. Minneapolis, known for its very cold winter weather, previously featured the Hubert H. Humphrey Metrodome, built downtown in 1982. It was the ninth oldest stadium in the NFL, featuring a fiberglass fabric roof, self-supported by air pressure. It was the third major sports facility to have this feature (the first two being the Pontiac Silverdome and the Carrier Dome). Preparation for the demolition of the Metrodome began the day after the final home game for the Minnesota Vikings on December 29, 2013. Demolition began January 18, 2014. For those wanting a glimpse, here is how the roof to the Metrodome came down. Owned by the Minnesota Sports Facilities Authority (MSFA), the multi-purpose US Bank Stadium is scheduled to host Super Bowl LII in 2018 and the NCAA Final Four in 2019. Some leap from the starting line! Designed by Dallas-based HKS Architects, the US Bank Stadium features the largest transparent ETFE roof in North America, spanning 240,000 square feet. This will be the only stadium in the nation with a clear ETFE roof. Because of the angles of the roof, ETFE material on the south side accounts for 60% of the entire roof, while hard metal deck on the north side will account for the remaining 40%. ETFE is a co-polymer resin which is extruded into a thin film. The light-weight material is transparent but can be treated to be translucent. It is durable and resistant to corrosion. In an architectural application ETFE is typically used in a multi-layer pneumatic system. This material does not degrade with exposure to UV light, atmospheric pollution, harsh chemicals, or extreme temperatures. The material has withstood extensive testing within extreme environments and is expected to have a 30 to 50-year life expectancy, requiring minimal maintenance. Presently, the true life-cycle of ETFE is not known as the oldest applications are just hitting the 30-year mark with little to no replacement of system components. Despite its light weight (1/100 the weight of glass) ETFE is reported to handle snow/wind loads well. In sheet form, it can stretch three times its length without losing elasticity. Support rods are used with the stadium roof panels. The surface of the foil is non-stick and non-porous, which allows the natural action of rain to clean the surface. Deposits of dirt, dust and debris remain unattached and are washed away in the rain, meaning ETFE effectively self-cleans with virtually no need to clean externally. As Amy Wilson has written on Architen, “Originally invented by DuPont as an insulation material for the aeronautics industry, ETFE was not initially considered as a main-stream building material, its principle use being as an upgrade for the polythene sheet commonly used for green house polytunnels. Indeed! Just take a look at this showcase taking place near the Mississippi River. We understand what’s involved in recovering renewable heat from the Earth by deployinggeothermal recovery technologies. Now it’s time to become familiar with another untapped renewable energy resource: wastewater thermal energy. The time-honored adage that we sometimes learn best by the mistakes we’ve made is now being applied by scientists at the National Renewable Energy Laboratory (NREL) in their study of defects in solar cell defects, stating the results may lead to improved performance. The study reports about certain defects in silicon solar cells which may eventually improve their overall performance. The findings run counter to conventional wisdom, according to Pauls Stradins, the principal scientist and a project leader of the silicon photovoltaics group at NREL. Schematic of a ‘good’ defect (red cross), which helps collection of electrons from photo-absorber (n-Si), and blocks the holes, hence suppresses carriers recombination.The findings run counter to conventional wisdom, according to Pauls Stradins, the principal scientist and a project leader of the silicon photovoltaics group at NREL. Deep-level defects frequently hamper the efficiency of solar cells, but NREL’s theoretical research suggests such defects with properly engineered energy levels can sometime improve carrier collection out of the cell, or “improve surface passivation” of the absorber layer. NREL researchers conducted simulations to add impurities to layers adjacent to the silicon wafer in a solar cell. Specifically, they introduced defects within a thin tunneling silicon dioxide (SiO2) layer that forms part of “passivated contact” for carrier collection, and within the aluminum oxide (Al2O3) surface passivation layer next to the silicon (Si) cell wafer. In both cases, specific defects were identified to be beneficial. According to NREL press information, the research by Stradins, Yuanyue Liu, Su-Huai Wei, Hui-Xiong Deng, and Junwei Luo, “Suppress carrier recombination by introducing defects: The case of Si solar cell,” appears in Applied Physics Letters. The researchers state finding the right defect was key to their research process. The referenced defects were then sorted according to their energy level and charge state. It is believed more research is needed in order to determine which defects will ultimately produce the best results. A recent study by the same authors has shown that the addition of oxygen could improve the performance of those semiconductors. For solar cells and photoanodes, engineered defects could possibly allow thicker, more robust carrier-selective tunneling transport layers or corrosion protection layers that might be easier to fabricate. The research was funded by the U.S. Department of Energy SunShot Initiative as part of a joint project of Georgia Institute of Technology, Fraunhofer ISE, and NREL, with a goal to develop a record efficiency silicon solar cell. The SunShot Initiative is a collaborative national effort that aggressively drives innovation to make solar energy fully cost-competitive with traditional energy sources before the end of the decade. Tesla founder and CEO Elon Musk addressed an audience at Paris Sorbonne University during the 2015 Council on Climate Change held in Paris. His subjects: climate change, fossil fuels, the carbon cycle. The video, including audience questions is here.